We'll expand, though we really may do so." 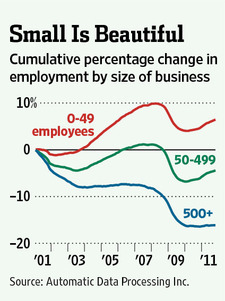 Small businesses say they aren't hiring, yet they keep adding workers. That's the paradox examined by Kelly Evans, the Wall Street Journal's Ahead of the Tape reporter. 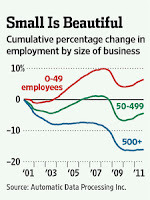 As shown in the chart, employment at small companies (50 or fewer employees) has grown by 6.5% since 2001, and such firms have added net new jobs in each of the last five months. On the other hand, the National Federation of Independent Business "optimism index" has averaged below 90, a level associated with a downturn, for the last two years. Although the October index has just come in at 90.2 - the highest since June - only 3% of small business owners told the NFIB that they intend to hire in the next three months. What would explain the gap between the gloomy talk and the more confident walk? Overheard in the MF Global Accounting Dept.